We look at the railways around the multi-national city of Basel and its surrounds– starting in the nearby French city of Mulhouse and concluding west of Zürich at Brugg AG – a journey over one of the busiest railway lines for international traffic in Europe. Mulhouse is an important centre for international passenger traffic: Lyria TGVs from Switzerland ply routes to Paris, loco hauled CORAIL express run between Basel and Strasbourg and there are domestic TGVs passing through on their way to French cities in the south by way of the new Rhine – Rhône LGV. 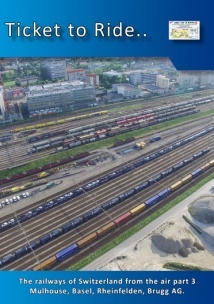 At Basel we look at the main station, the SBB main classification yard at Muttenz, the southern approaches and the incredibly busy station at Pratteln. East of Pratteln we visit Rheinfelden, for the rail connected brewery of Feldschlösschen, the industrial ‘village” of Möhlin, Stein-Säckingen, Frick and Brugg AG. Because of the proximity to Basel airport aerial footage is more limited than on other ‘Swiss Railways from the air” films until we are east of the city.